Possible the most confusing album release I’ve covered in this series, for some reason the debut album for the 90s most prolific boyband was never released in their home country of the US. Backstreet Boys was a commercial smash across the globe following hit singles like Quit Playing Games (With My Heart) and We’ve Got It Going On, but outside of the former none of the songs had really taken off in the US. Perhaps this is to blame for the lack of release, but the day after their second album Backstreet’s Back was released worldwide a second album called Backstreet Boys was released as their official US debut. An amalgamation of tracks from both albums, these two releases count towards that sales figure above and to the pains in my head as I try and unpack the situation at hand. 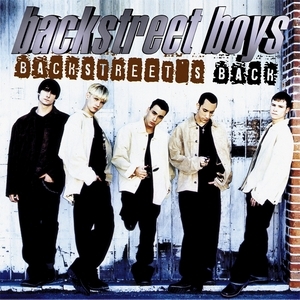 Unsurprisingly, the US release that contains all of the biggest hits from the two albums is the stronger run of songs, outside of the outstanding title track Everybody (Backstreet’s Back) and As Long As You Love Me the rest of the album feels like a steady run of Boyz II Men style melodramatic ballads. The addition of a single like Get Down (You’re The One For Me) with it’s ‘rap moment’ makes the featherweight hook of Hey, Mr DJ (Keep Playin’ That Song) all but redundant, while opener We’ve Got It Going On is full of trademark Max Martin 90s motifs. The strongest track that didn’t make the trip for the US version is probably That’s The Way I Like It, which is exactly the sort of funk fueled pop song I expected from the album. The Boyz II Men comparison rears its head through every single ballad and it’s obvious that these Boys don’t have anywhere near as much soul, or vocal chops as those Boyz. You also wonder just how bad they think they are when they explain on the Michael Jackson new jack swing alike If You Want It To Be Good Girl (Get Yourself a Bad Boy). As an album, there’s more than enough knockout hooks here to appease any slight pop music fan, even if when you delve any deeper than that the appeal of AJ, Howie, Nick, Kevin and Brian gets lost pretty quickly. Best Track: Everybody (Backstreet’s Back) is obviously the group’s best uptempo hit and here it shines way above just about everything else. Tags: Backstreet Boys, Backstreet's Back, Everybody (Backstreet's Back), The World's Greatest Hits. Bookmark the permalink.